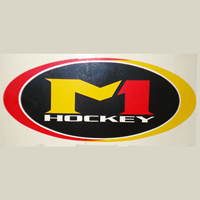 J.B. Marketing, Inc., owned and operated by Jerome Bonnett ran the Mach 1 Hockey Division into a thriving product line of hockey equipment and was actually credited with creating the first pair of inline roller hockey pants in the early 1990's. Jerome came from a small town in Minnesota to Southern California and continued his ice hockey playing for many years. With the growth of roller hockey and with Jerome's injection molding background and skills he filled many voids in the roller hockey puck and apparel segments of the market. His Mach 1 Hockey teams were wearing out the knees of the sweat pants he made so with the help of his rep group Rep West and others he designed the first pair of full nylon roller hockey pants, later to be later improved by Black Biscuit Hockey Pants and Mission Hockey Pants. Later Alex R. Bellehumeur, the inventor of the PUCK FOR USE ON A NON-ICE SURFACE would sue Jerome for patent infringement even though Mach 1 roller hockey pucks had many improvements such as improved glider pins, a glow in the dark puck, and both cold and warm weather pucks. Because of Alex R. Bellehumeur's lawyers and trials Jerome had to close his business after many years of community service and a true pioneer in the roller hockey market. He will always be remembered with the sport of Roller Hockey and he is sorely missed!